A golden brown, herbed turkey, casserole dishes of cheesy green beans and dressing and five pounds of cream cheese-enriched mashed potatoes. 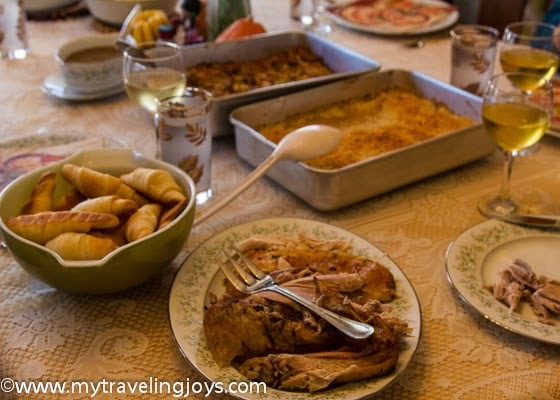 These were just some of the traditional Thanksgiving dishes I made last Sunday for my family in Nebraska. 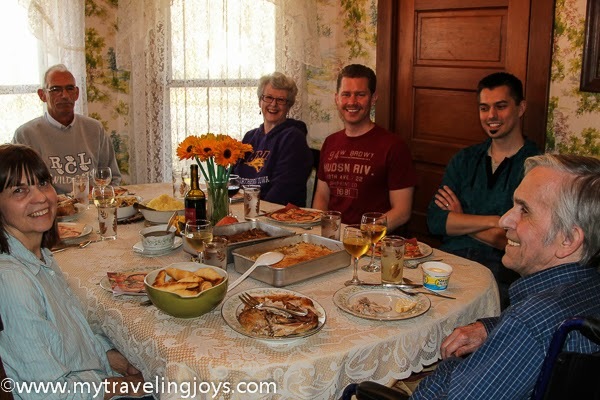 We celebrated our first Thanksgiving meal on American soil since 2009 with my mom, dad, brother, aunt and uncle. I had the menu all planned out and found it went off without a hitch minus the 12-pound turkey taking a bit longer to cook. Since my dad’s health isn’t the greatest, I modified my normal recipes by using reduced-fat cheese and fat-free sour cream for my cheesy green bean casserole dressed with panko bread crumbs instead of fried onions. To make the potatoes richer, I used low-fat cream cheese instead of butter and heavy cream. For the dressing, I only used chicken stock in place of butter to make the dish more moist. Then, I rubbed down the turkey with lots of garden-fresh herbs, freshly ground black pepper and some Smart Balance as well as filled the cavity with more herbs, onions and celery. 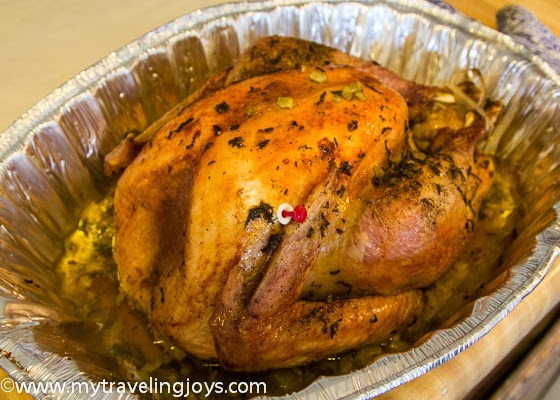 The end result was still a moist and golden brown turkey. I have to say you wouldn’t have noticed a difference! 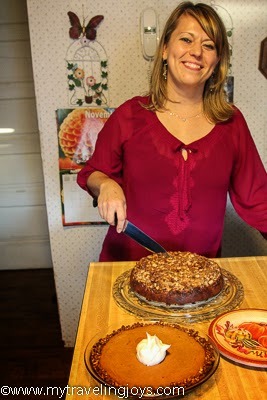 Even for my Thanksgiving baking, I lightened up my recipes. 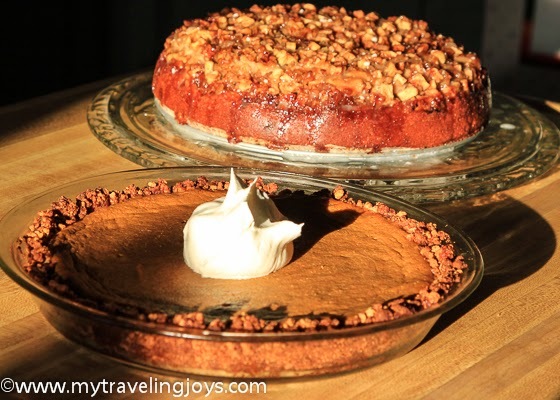 Instead of my normal buttery pastry crust for pumpkin pie, I used ground gingersnap cookies and graham crackers mixed with a little apple cider and corn syrup. The crust was a little sticky and more rustic looking, but most importantly, it tasted great with the pumpkin pie filling. Then, instead of an apple pie, I decided to make a low-fat apple cake for our second dessert. I found a recipe in one of my mom’s old issues of Light & Tasty magazine and made it even healthier with some substitutions below. The cake was moist and tasted like fall with the addition of ginger and cinnamon spices. I knew this cake was going to be a winner as soon as I tasted the spiced cake batter! Family pics from Thanksgiving 2013. 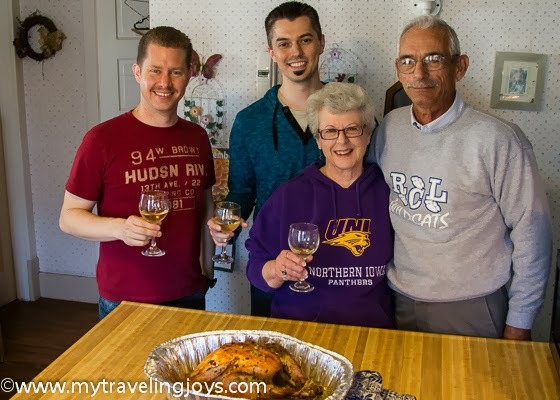 Next week, we will be celebrating a second Thanksgiving dinner with more than 20 members of my husband’s family on the East Coast. More food is definitely in store for us! Wherever you may be this holiday season, I hope it’s a happy one filled with plenty of good food! 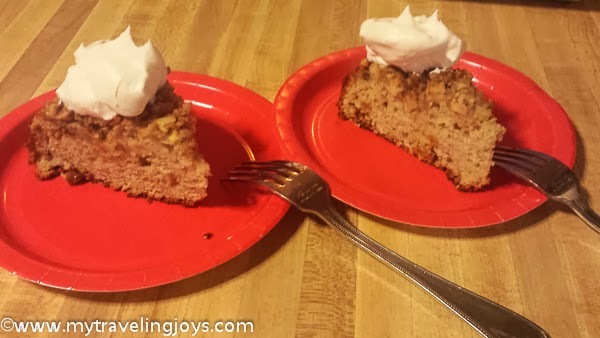 Low-fat apple cake topped with Cool Whip, of course! I'm ready to serve desserts! In a large mixing bowl, beat the butter and sugar together until crumbly, about 2 minutes. Add the egg, egg white, yogurt, applesauce and oil. Mix together. In a medium-sized bowl, mix together the dry ingredients. Combine the dry ingredients with the yogurt mixture, stirring just until moistened. Spread the cake batter into a nonstick pan lined with baking paper. Using a pastry brush, brush the pan with sunflower oil. In a separate bowl, toss together the apple, walnuts, sugar and spices. Spread this mixture on top of the cake batter. Bake the cake at 350 F/175 C for about 45 minutes or a toothpick inserted in the middle comes out clean. 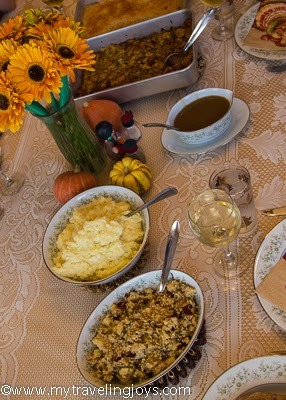 Our final Thanksgiving table shot. It looks absolutely fantastic! I am cooking up Friendsgiving on Sunday, we are pretty nervous about trying to pull it off for 16 people! @Joyce, ahhhh...how sweet of you to say that! That looks a fantastic spread - do tell what pumpkin pie spice consists of. 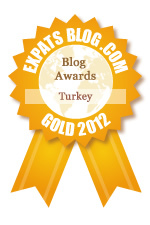 @Ozlem, yes, it has been good but exhausting being home with everyone too! Happy Thanksgiving Joy! Your spread looks delicious (can't say I'm surprised).